I loved theatre back in high school. It was probably the only reason why I bothered going to school at all. My main excitement for school was Forensics, Theatre, and the show choir and other stuff was probably somewhere else on the list, too. 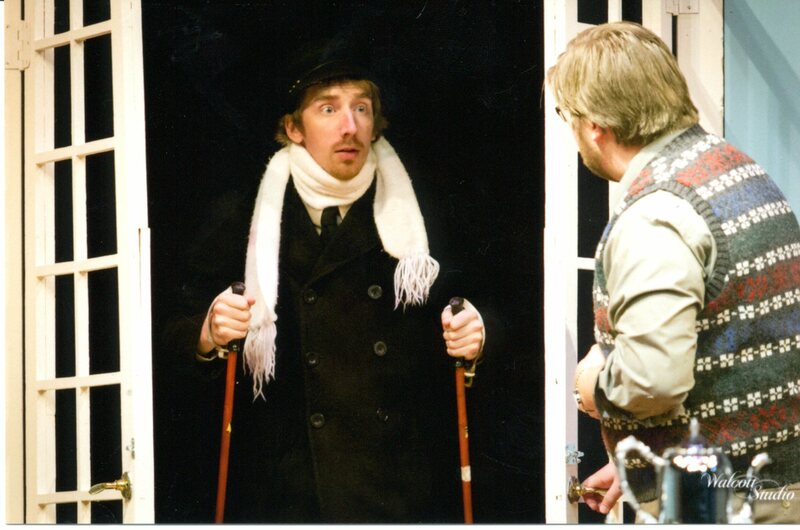 It helped that at a small school like Brodhead, there weren’t a lot of male actors so even an average fellow like myself was almost assured a good role in a 6-10 person play. Our director was a wonderful old man who had been a former teacher in Brodhead while my mother was a student, and he was a great guy to work with. 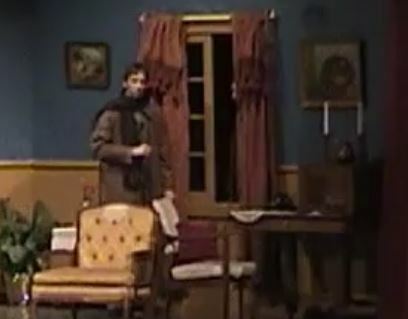 The play we did my sophomore year, when I was around 14 or 15, was Agatha Christie’s The Mousetrap. I played Giles Ralston, the suspicious husband, and my friend Forrest played Christopher Wren – oh man, did he have the hair for it at the time. His older sister was a senior at the time, and she played Giles’ wife, Mollie Ralston. The exact same scene as above (taken as a frame capture from an ancient VHS tape), except in my former role. A couple months ago, Jan emailed me and asked me if I wanted the part of Sgt Trotter, the police officer investigating a murder that occurs offstage right before the play starts. I recalled it being a fun part back in high school, and I’d never before been involved with a play for a second time. I thought it might give me some interesting insight, playing two different characters that see things from two different perspectives. We had a five-show run over two weekends, and considering that it played in Columbus, a small town half an hour to the north of Madison, it was very well attended. Some of my castmates were from Beaver Dam, where I learned to my envy that their community theatre program is so well-respected in town that they can have upwards of 400 people at their musicals per show. What I wouldn’t give for those sort of audiences, anywhere in Madison! Our rehearsals were in the cafeteria of a local church. 10 minutes before and after each rehearsal were dedicated to the chore of moving all of the lunch tables out of the way in order to set up folding chairs, pews, and random pulpits around the space to stand in for tables, radiators, and fireplaces. The performances were held in Columbus High School, in a “gymatorium.” Brodhead High School used a “cafetorium” instead – which was pretty terrible in terms of acoustics – but the nostalgia was real. It was also weird to be on the “older half” of the eight cast members – two men were in their mid to late 50’s, one woman was early 40’s, and there was me, exactly twice the age that I was when I had played Giles in 2001. The other half of the actors ranged from a year younger than me to our Giles, a 20 year old man. I’ve never been one of “the older cast members” before. To make matters more fun, on the Thursday morning between our weekends of shows, my left lung partially collapsed again – the first time since December 2011. A smaller collapse than the two previous, but thanks to my pleurodecisis surgery, it was supposed to be prevented outright. I guess maybe 3.5 years is the best I could hope for. As I write this, I haven’t gotten it corrected yet – now that cats are living in the house I didn’t want to leave them alone when I spend the night in a hospital with an oxygen mask. Next week should be a good time for that. I was worried at first that Sgt. Trotter’s frenetic style of motion and acting would leave me wheezing onstage but I figured that since I made it through Thursday night’s “speed runthrough” of lines without passing out, I could handle the actual performances with aplomb. And I did! I actually think that my need to slow down a bit so as not to start wheezing on stage probably made for a better performance than usual. Making a note of it – be sure to…partially…collapse lung…before each show. Done.